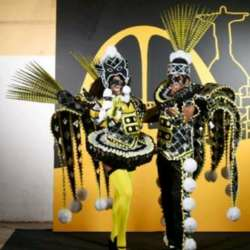 Protected content IS A SAMBA SCHOOL LOCATED IN BOTAFOGO BUT THE HEHEARSAL HAPPENS AT IT'S CIDADE NOVA NEGHBORHOOD ADRESS. Protected content WAN A TROPHY AT THE Protected content , Protected content Protected content . AT THE REHEARSAL IS USUALLY OFFERED FOR THE VISITORS A SAMBA SHOW. THE Protected content SCHOOL THEME IS CALLED "E O SAMBA SAMBOU". I AM SURE IT WILL BE A PLEASANT PLACE TO BE.